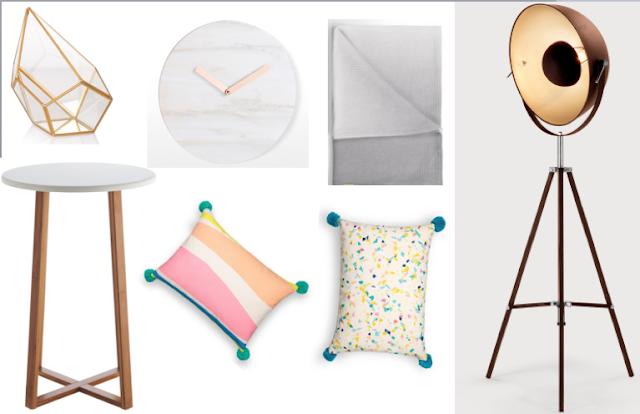 Recently I've found myself perusing online at new accessories and homeware for my flat. Even when your flat is meant to be all done and finished there is always something new that tempts me to have a change/ rearrange. I would really like a floor lamp and side table for my living room that blend in with my new kitchen (See a blogpost all about it here). I really like this side table from habitat with its white top and bamboo cross legs. I am also in LOVE with this floor lamp from made.com- it is so unique and unusual. I think this would look amazing next to my table and chairs. I was also thinking about giving the bedroom a Spring makeover with a new throw and cushions, Oliver Bonas have nailed their Spring collection with some lovely accessories for the home, I recommend checking them out.